1 1/4" plastic bobber (FBOB4) and 1 1/2" plastic bobber (FBOB5). Available in red and white only. 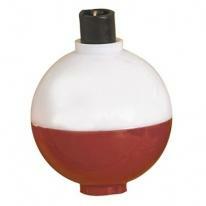 Imprint Areas: Bobber 0.75"w x 0.5"h Oval Note: Additional color available, call for pricing. 1 1/4" plastic bobber (FBOB4) and 1 1/2" plastic bobber (FBOB5). Available in red and white only. Note: Additional color available, call for pricing. Imprint Size : 7/8"X 3/4" Oval. Pan fish fishing hooks with a printed full color insert. 1-4 color custom imprint. Business card - 100 minimum. 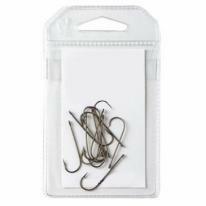 Imprint Areas: Hook Pack 3.5"w x 2"h.
2 Assorted Flies in Matchbook. 1-4 color custom imprint. Imprint is on the matchbook (One Side Only) 100 minimum. Imprint Areas: Matchbook 1.5"w x 2"h.
2 1/4" Flash Spoon. 2 1/4" flash spoon, available in red and white only. Packaged in a safety clam. Business card packaging upgrade available (F9001) for 0.89 each. Imprint Size : 1"X 1/2" Note: Additional color available, call for pricing. 2 7/8" Flash Spoon. 2 7/8" flash spoon available in red and white or white. Packaged in a safety clam. Business card packaging upgrade available (F9001) for 0.89 each. 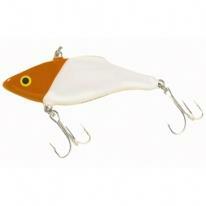 Imprint Size : 1 1/4"x 3/4"
The Rattling Wild fishing lure is 3" long. (This is not a Rapala lure.) Only available in Black & Silver (as pictured). Imprint Size: 1"X 3/8" Note: Additional color available, call for pricing. Makes fish attack. Size: 2 3/4" Imprint Size: 1"X 3/8" Note: Additional color available, call for pricing. Rapala fishing clipper with knife and line pick, includes a 36" Rapala neck lanyard. 1 color white imprint only. Imprint Size: 1/2"X 3/4"
The original floting Rapala. Size : 2 3/4" Imprint Size: 1"x 1/4" Note: Additional color available, call for pricing. The original floting Rapala. 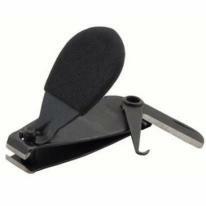 Size : 3 1/2" Imprint Size: 1"x 1/4" Note: Additional color available, call for pricing. Rapala X-Rap fishing lure, xtreme action slashbait. Size 10: 4" freshwater, Size 10S: 4" saltwater Imprint Areas: Lure 1"w x 0.375"h Note: Additional color available, call for pricing. The original floating Rapala. 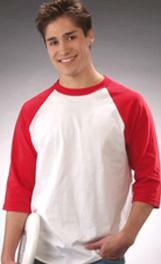 Size : 4 3/8" Imprint Size: 1"x 1/4" Note: Additional color available, call for pricing. The bait that sets the standard. Size 8: 3 1/2". Imprint Size : 1"X 3/8". Note: Additional color available, call for pricing. Rapala 15 lb fishing scale. 1 color custom imprint. Imprint on handle 50 minimum. 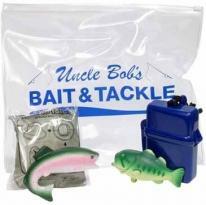 Imprint Areas: Front 0.875"w x 1.25"h.
The Mini Cooler Kit is great for a day of fishing! Comes with a Rattlin� Rapala black pearl lure, a 16� x 16� microfiber towel, a Smartshield SPF 30 sunscreen towelette with insect repellent and a 2 7/8� spoon key chain packaged in a mini soft sided cooler. 1 color imprint only on cooler. Imprint Size Rattlin' Rapala: 1"X 3/8" Towel & Cooler: 5 1/2"X 3 1/2" Note: Additional color available, call for pricing. The Go Fishing Kit includes a Rattlin' Rapala red head lure, a 1 1/2" plastic bobber, a 16" x 16" microfiber towel and a Smartshield SPF 30 Sunscreen towelette with insect repellent in a 32 oz. plastic water bottle with a carabiner clip. 1 Color Imprint Only on Water Bottle. 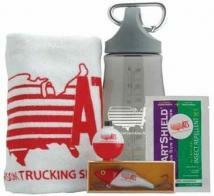 Imprint Size: Rattlin Rap and Bobber: 7/8" x 3/8" Towel: 5" x 5" Water Bottle: 2" x 1 1/2". Note: Additional color available, call for pricing. Johnson citation fishing combo features a strong integrated frame and spool, trouble-free drag system, and a durable 5' 6" fiberglass rod. Also comes pre-spooled with Berkley Trilene fishing line. The Closed face push button type reel is most commonly used by beginner anglers. 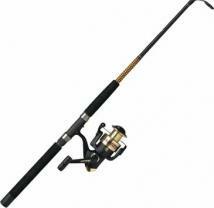 Reel Size: 1, Reel Bearings: Bushing, Reel Drag: Star, Rod Pieces: 2, Rod Power: M, Guide #: 4. Product Dimensions: 5'6" Rod Length Imprint Size: 1.5"W x 0.375"H. Case Pack Qty: 4 Case Pack Shipping Weight (lbs. ): 6. Mitchell pesca spinning combo features a ball-bearing drive for smooth operation, double drilled diecast aluminum spool for reduced weight and durability, and a cork handle for comfortable grip. The graphite composite rod offers increased strength and durability. Reel Size: 1, Reel Bearings: Bushing, Reel Drag: Front, Rod Pcs: 2, Rod Power: M, Guide #: 5. Product Dimensions: 6"0" Rod Length Imprint Size: 1.5"W x 0.375"H. Case Pack Qty: 3 Case Pack Shipping Weight (lbs. ): 3.5. Berkley 50lb digital fish scale is switchable from pounds to kilograms and is cable of storing weights from 8 items. Other features include water resistant construction, wide distribution, large head loop and large display. This scale uses 2, CR2032 batteries (included). Product Dimensions: 10" X 3-1/4" X 7/8" Imprint Size: 1.25"W x 1"H Case Pack Qty: 3 Case Pack Shipping Weight (lbs. ): 2. 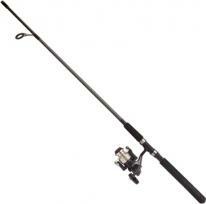 Features the one ball bearing FX2500 graphite reel with Varispeed, aluminum spool, 1 ball bearing and 4.6:1 gear ratio. The 6-foot FX 2-piece rod is constructed of fiberglass blanks with foam grips and aluminum oxide guides. Mitchell outback se spinning combo features a 3 bearing drive, quality graphite composite rod for increased strength and durability, and a cork handle for comfortable grip. This combo comes pre-spooled with Berkley Trilene fishing line. Reel Size: UL, Reel Bearings: 3 Bushing, Reel Drag: Front, Rod Pcs: 2, Rod Power: UL, Guide #: 5. Product Dimensions: 5'0" Rod Length Imprint Size: 1.5"W x 0.375"H. Case Pack Qty: 4 Case Pack Shipping Weight (lbs. ): 3. Shakespeare ladyfish spinning combo features a 30 size graphite spinning reel spooled with 6 lb. test line, quality two-piece medium action tubular glass rod, and a cork handle for comfortable grip. 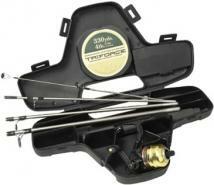 This rod reel combo has 2 ball bearings plus a one way clutch and aluminum spool. Reel Bearings: 2, Reel Drag: Spinning, Rod Pieces: 2, Rod Power: M. Product Dimensions: 5'6" Rod Length Imprint Size: 1.5"W x 0.375"H. Case Pack Qty: 5 Case Pack Shipping Weight (lbs. ): 5. Shakespeare Ultralight Spinning Hard Case Fishing Travel Kit includes a 6-piece, ultralight, telescopic rod that collapses down to 14", 30 size spinning reel pre-spooled with 6 lb line. Durable hard side case has built-in adjustable storage compartments. Product Dimensions: 16"x9-3/4"x3-1/4" Imprint Size: 4-3/16"W x 2-1/16"H (shape) Case Pack Qty: 5 Case Pack Shipping Weight (lbs. ): 6.5. Freshwater Spinning Combo features the AX2500 graphite reel with Varispeed, 1 ball bearing, Dyna-balance and 5.2:1 gear ratio. The 6-ft, 6-in 2-piece rod is a graphite composite blank with cork grips and aluminum oxide guides. 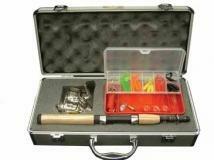 5' 6" collapsible rod with ceramic guides & an open cast reel in a black nylon carry case. Imprint Size: 7"X 3 1/2" Note: Additional color available, call for pricing. Go Fish Ii Package Includes: (1) Tackle Bag, (1) Citation 2 pc Spincast Combo, (1) Pan Fish Buster Lure Kit. Case Pack Qty: 1 Case Pack Shipping Weight (lbs. ): 4. Abu garcia cardinal bruiser spinning combo is Bruiser tough for big fishing applications. The new heavy duty standard for both fresh and saltwater applications, the Bruiser combo is built with the quality you can only get from Abu Garcia. The rod reel combo features a tough rod with EVA handle and comes pre-spooled with Berkley Trilene fishing line. 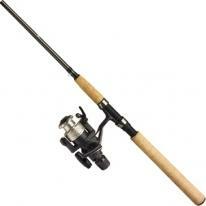 Reel Size: 6, Reel Bearings: 4, Reel Drag: Front, Rod Pieces: 2, Rod Power: MH, Guide #: 5. Product Dimensions: 7'0" Rod Length Imprint Size: 1.5"W x 0.375"H. Case Pack Qty: 4 Case Pack Shipping Weight (lbs. ): 5. Abu garcia stealth spinning combo features a 7 ball bearing drive with instant anti reverse, mounted on a premium IM8 graphite rod for maximum sensitivity and durability, and a cork handle for comfortable grip. Reel Size: 4, Reel Bearings: 7, Reel Drag: Front, Rod Pieces: 2, Rod Power: MH, Guide #: 7. Product Dimensions: 7'0" Rod Length Imprint Size: 1.5"W x 0.375"H. Case Pack Qty: 4 Case Pack Shipping Weight (lbs. ): 4. The Angler Ii Package includes: (1) Tackle Bag, (1) Pro Touch 2 pc Spinning Combo, (1) Excursion 24, Soft-Side Cooler, (1) Pan Fish Buster Lure Kit. Case Pack Qty: 1 Case Pack Shipping Weight (lbs. ): 5. The Angler Ii Package includes: (1) Tackle Bag, (1) Pro Touch 2 pc Spinning Combo, (1) Excursion 24, Soft-Side Cooler, (1) Pan Fish Buster Lure Kit. Imprint Size: 6"W x 3"H Case Pack Qty: 1 Case Pack Shipping Weight (lbs. ): 5. US40XA Regal Underspin reel-Aluminum nose cone, Left and right hand retrieve and comes with pre-wound 4 lb test line, MS465ULFS 5-pc., 4-1/2 ft graphite composite rod, Ultra light with EVA foam grip, Molded case included. Shakespeare big water spinning combo offers a graphite spinning reel with ball bearing and anodized aluminum spool, dependable multi-disk drag system and comfortable EVA grips and durable double-footed guides. 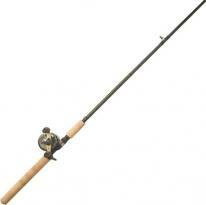 The two-piece medium action Ugly Stik rod features genuine Fuji guides and reel seat. Reel Bearings: 1, Reel Drag: 10-25, Rod Pieces: 2, Rod Power: M, Guide #: 5 + tip. Product Dimensions: 7'0" Rod Length Imprint Size: 1.5"W x 0.375"H. Case Pack Qty: 5 Case Pack Shipping Weight (lbs. ): 12. 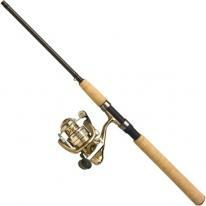 Freshwater Spinning Combo includes the Sedona 2500 reel with the Scimitar 6 1/2 foot 2-piece graphite rod with cork handles, Other features include : 3A-RB ball bearings, Super Stopper II, Fluidrive, Dyna-Balance, Power Roller. Mitchell avocet hardside travel pack includes a 5-piece, medium action 5' 6" rod, pre-spooled Avocet S500UL Spinning Reel, and 25 piece tackle pack. Product Dimensions: 16-3/8" x 8-1/8" x 4" Imprint Size: 6"W x .75"H Case Pack Qty: 1 Case Pack Shipping Weight (lbs. ): 6.5. Mitchell 308xe spin/fly hardside travel case includes a 5-piece, medium-light 5' 6" rod , 8-bearing spinning reel with instant anti-reverse, 5/6 wt. fly reel, and 25 piece tackle pack. Product Dimensions: 14-1/2" X 17-3/4" X 4" Imprint Size: 4.75"W x 1.375"H Case Pack Qty: 1 Case Pack Shipping Weight (lbs. ): 6. Mitchell 308xe spin/fly hardside travel case includes a 5-piece, medium-light 5' 6" rod, 8-bearing spinning reel with instant anti-reverse, 5/6 wt. fly reel, and 25 piece tackle pack. Product Dimensions: 14-1/2" X 17-3/4" X 4" Imprint Size: 5.75"W x 1.625"H Case Pack Qty: 1 Case Pack Shipping Weight (lbs. ): 6. 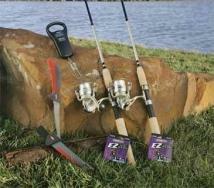 Fishing for 2 Package includes: (2) Outback SE 2 pc Spinning Combos, (2) 6 lb. Super Mono EZ Fishing Line (110 yd) ea., (1) 50# Digital Fish Scale, (1) 6" Standard Flex Fillet Knife w/ Sheath. Case Pack Qty: 1 Case Pack Shipping Weight (lbs. ): 4. Freshwater Baitcasting Combo includes the Corvalus 300 reel with the Scimitar 6 1/2 foot 1-piece graphite rod with cork handles, Other features include : Easy-Mag, graphite frame, aluminum spool, 3 ball bearings, Super Stopper II. Fishing for 2 Package with 1 Color Screen Imprint on Outback SE Combo. 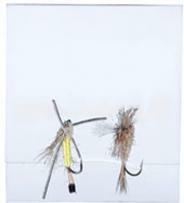 Fishing for 2 Package includes: (2) Outback SE 2 pc Spinning Combos, (2) 6 lb. Super Mono EZ Fishing Line (110 yd) ea., (1) 50# Digital Fish Scale, (1) 6" Standard Flex Fillet Knife w/ Sheath. Imprint Size: 1.5"W x 0.375"H Case Pack Qty: 1 Case Pack Shipping Weight (lbs. ): 4. Fishing for 2 Package with Full Color Decal Imprint on Outback SE Combo. 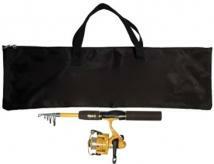 Fishing for 2 Package includes: (2) Outback SE 2 pc Spinning Combos, (2) 6 lb. Super Mono EZ Fishing Line (110 yd) ea., (1) 50# Digital Fish Scale, (1) 6" Standard Flex Fillet Knife w/ Sheath. Imprint Size: 1.5"W x 0.375"H Case Pack Qty: 1 Case Pack Shipping Weight (lbs. ): 4. I found everything I was looking for Thank you Lynada! ..